Thulisa Keyi or Pearl Modiadie? What happens when two celebrities with pretty much the same taste in fashion rock up at separate events wearing the same outfit? Well, we’re kicking off this new week with a fashion face off like no other. Thulisa Keyi and Pearl Modiadie are industry professionals with a passion for looking great and expanding their reputable brands. When it comes to styling, TV personality Pearl Modiadie has modeled for some of the biggest clothing brands and designers. 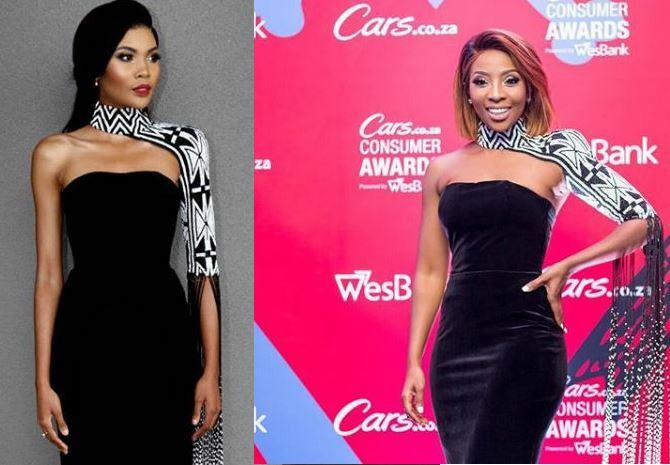 The beaut was recently spotted at the red carpet of the Cars Consumer Awards in a black number from La Maison de Couture. Her fashion transformation is undeniably deemed as one the best in the game as she keeps raising the bar high! The award-winning TV host’s wardrobe is beaming with smart, simplistic and endless style. Not so long ago, model Thulisa Keyi also posted a similar looking outfit on social media which she wore at the 2018 Miss World pageant in China.